I recently flew to San Francisco and back in the span of four days, and chose to celebrate the many hours of air travel with what I call a “dry aviation” — the normal cocktail contains a half ounce each of maraschino and lemon juice, and a quarter ounce of creme de violette. I’ve dropped that to a scant quarter ounce of the first two ingredients, and a barspoon of the latter, without decreasing the gin. This makes for a much more spirit-focused drink, with hints of citrus, sweet, and floral. Frankly, I like it better than a regular aviation, which is a little too sweet-n-sour for my taste. 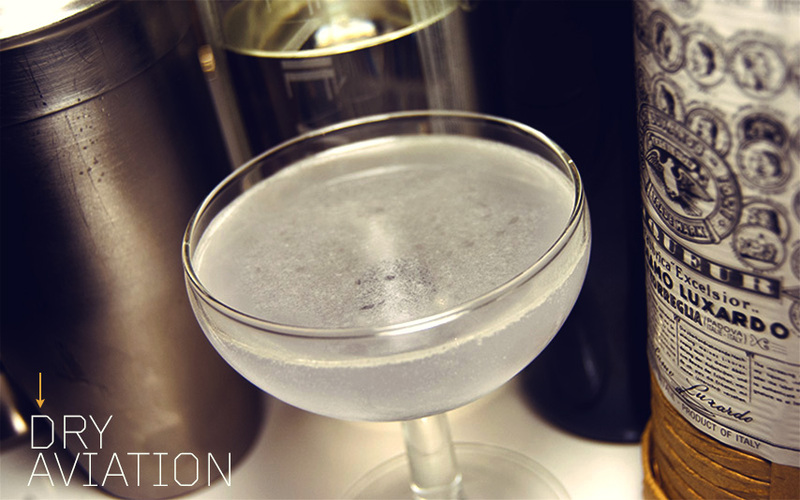 If you don’t like your drinks so spirit-forward, then a regular aviation is probably more your style. Don’t sleep on the crème de violette, though! It elevates what is effectively a gin sour into something much more interesting. I’m not including them in the recipe, since a traditional Aviation doesn’t call for them, but I also added a few drops of my Asian citrus bitters, and they worked quite nicely. Combine ingredients over ice in a cocktail shaker and shake thoroughly. Strain into a chilled cocktail coupe. Garnish with a Luxardo maraschino cherry. Sounds like a classy drink!